The person doing the excavating work must call 811 at least two business days before digging (not more than 10 days in advance). Lewis PUD and other local utilities will mark their underground lines at no cost. Utilities owned and maintained by the property owner are not included in this service. If you dig into an underground electric line, get away and keep others away. Do not handle the line or try to repair it. Notify the PUD to repair any damaged lines before back filling. Make sure to call 811 at least two business days in advance of digging. Prior to calling you must mark the area where you plan to dig with white paint. This helps locating personnel find the right area and locate nearby facilities as accurately as possible. By calling this one phone number, all public utilities in your work area will be contacted for you. Do not use machinery to dig any closer than 24-inches on either side of the marks. Locating equipment is usually accurate, it is important however that you allow at least a two-foot “tolerance” zone. When you have to dig within 24 inches of the utility line, use a hand shovel as you cross over an existing line or approach an existing above-ground facility such as a transformer, pole or meter base. Dig very slowly and cautiously, as it is common for underground lines to be shallow in these areas. Utility lines are normally buried at approved depths of two feet or more, but conditions can change. Shallow utility lines may be present in areas of previous excavation or landscaping. 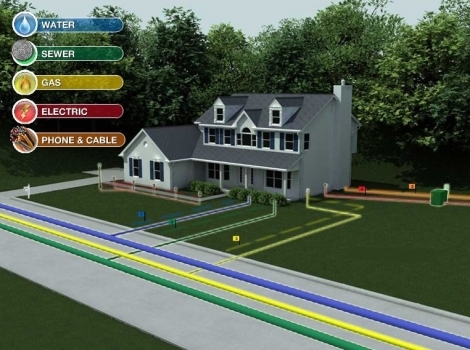 Underground lines may exist between the house and outbuildings or wells. The utility company does not mark these privately owned lines.